I am a feta cheese lover. 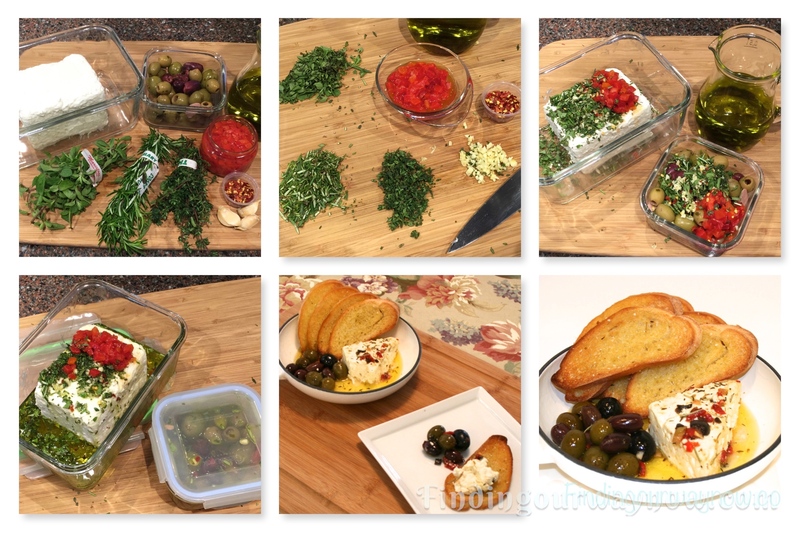 This Warm Marinated Feta Cheese with Olives recipe was created as a result of an appetizer I had at a local restaurant. It was a great recommendation by our server and I fell in love with it. It also set in motion my desire to re-create it at home. After taking some notes to determine what I thought the ingredients were in the appetizer, below is my final result. 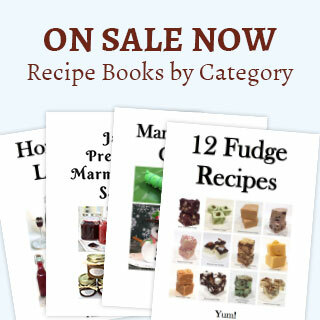 I actually like my recipe more than the restaurant’s appetizer. Marinated Feta Cheese – Place the block of Feta in a container with a tight lid. Mix all the ingredients for the marinade and pour it over the feta cheese. Cover and marinate in the fridge for at least 24 hours. Gently turn the container every few hours to evenly marinate the feta. Marinated Olives – Drain the olives and put them in a container with a tight lid. Mix all the ingredients for the marinade and pour it over the olives. Cover, shake and marinate in the fridge for at least 24 hours. Shake and turn the container every few hours. When you’re ready to serve, take the two containers out of the fridge and allow them to come to room temperature. Heat your oven to 300° F. Cut the marinated cheese into 4 wedges. Place a wedge of cheese in a small casserole dish or skillet. Drizzle a bit of the marinade over the cheese. Place a scoop of olives on the side. 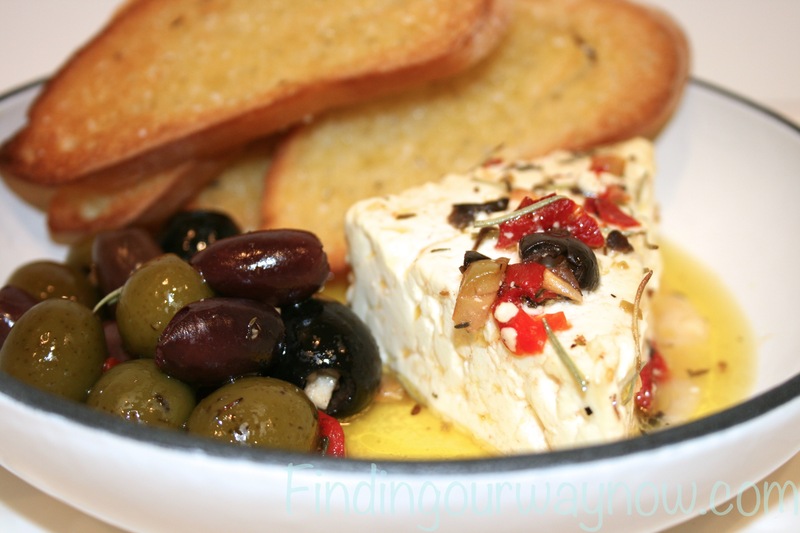 Warm the marinated Feta cheese and olives in the oven until the cheese just starts to melt, about 10 to 12 minutes. Serve it with thin slices baguette, crostinis or neutral crackers. Notes: The olive oil may thicken in the fridge. It will turn back to a liquid form at room temperature. Make sure to use fresh herbs; they make a huge difference in the end product. Be careful not to overdo the pepper flakes. For a larger gathering, you can warm the whole block of feta with the olives in a larger skillet or casserole; adjust the time to allow it to warm. You can keep any leftovers in the refrigerator for a week or two. The beauty of this Warm Marinated Feta Cheese with Olives is it can be prepared in advance of any occasion or event. It makes a great appetizer for parties, guests, or anytime you want or need something a little different and a bit extra. Enjoy.